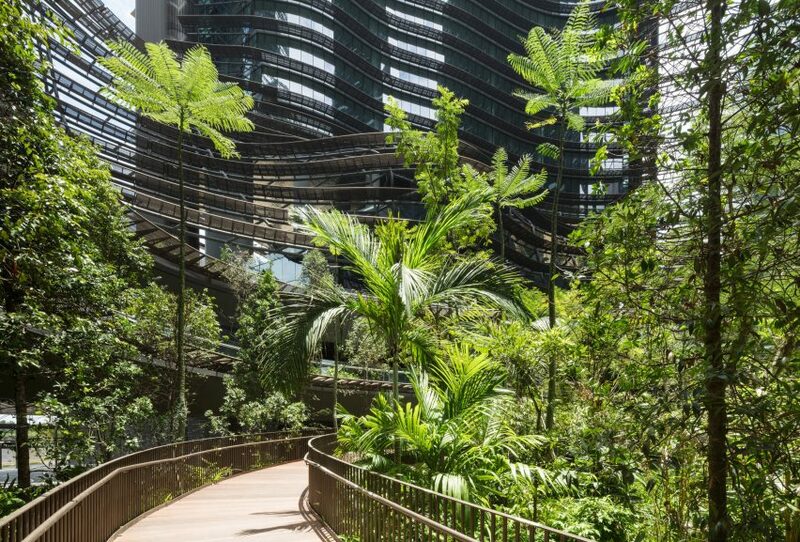 Snaking wooden walkways traverse a terraced garden planted with 700 trees at the heart of this tower development in Singapore’s Marina Bay by Ingenhoven Architects and landscape firm Gustafson Porter + Bowman. The Marina One development was designed by German studio Ingenhoven Architects and local firm A61 as a plant-covered “mountain”, comprising four high-rise blocks arranged around a central garden created by London-based studio Gustafson Porter + Bowman. 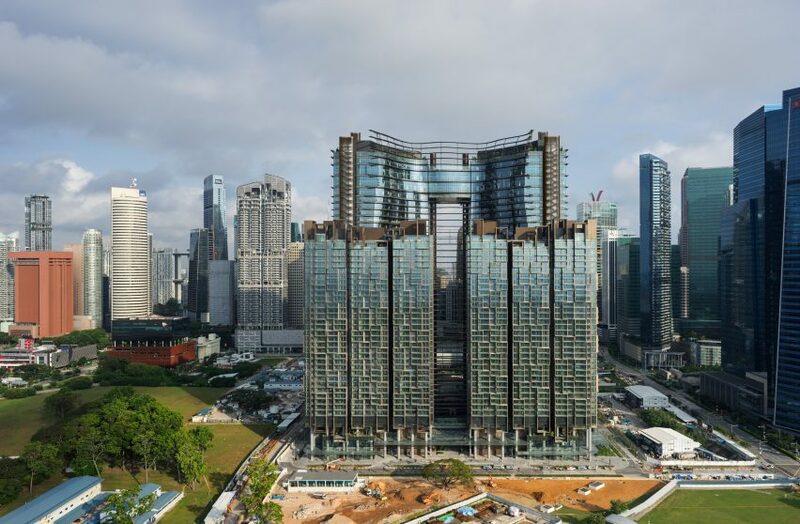 The complex, which is set to open at the end of 2017, is located within Singapore’s Marina Bay financial district – a 360-hectare expanse of reclaimed land on the waterfront that is also home to Moshe Safdie’s iconic Marina Bay Sands towers, as well as the huge tropical park, Gardens by the Bay. 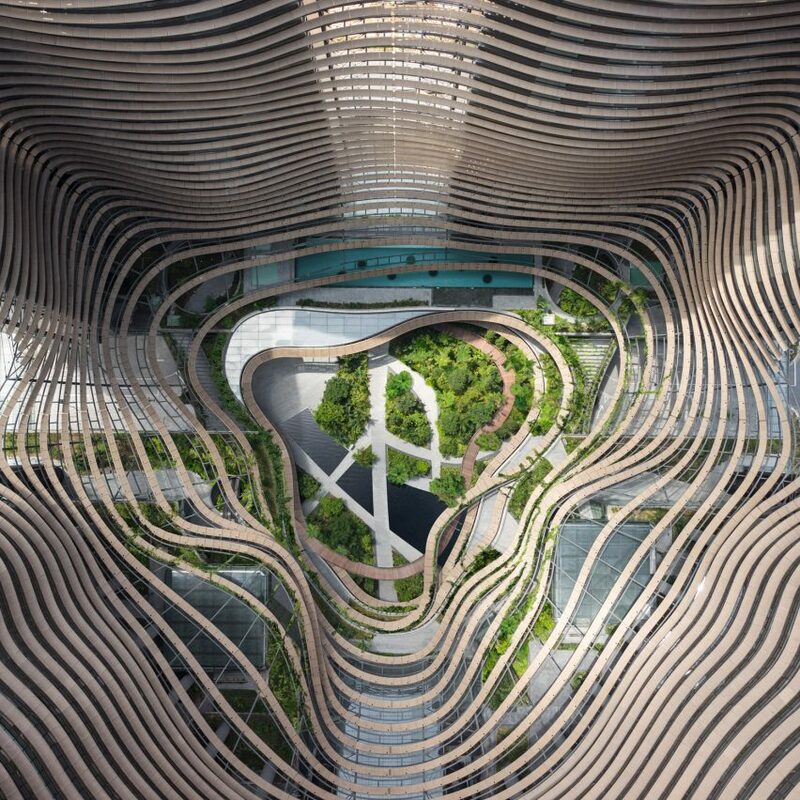 The towers accommodate offices, residential and retail functions arranged around an outdoor space called the “Green Heart”, which the architects described as “the largest public landscaped area in the Marina Bay Central Business District”. While the building’s outer elevations feature boxy geometric forms culminating in protruding open frames, the fluid interior surfaces are lined with undulating louvres that extend all the way down to the central courtyard. As they reach the lower levels, the louvres move away from the internal elevations to form the edges of terraces that accommodate over 350 types of trees and plants spread over a total area of 37,00 square metres. 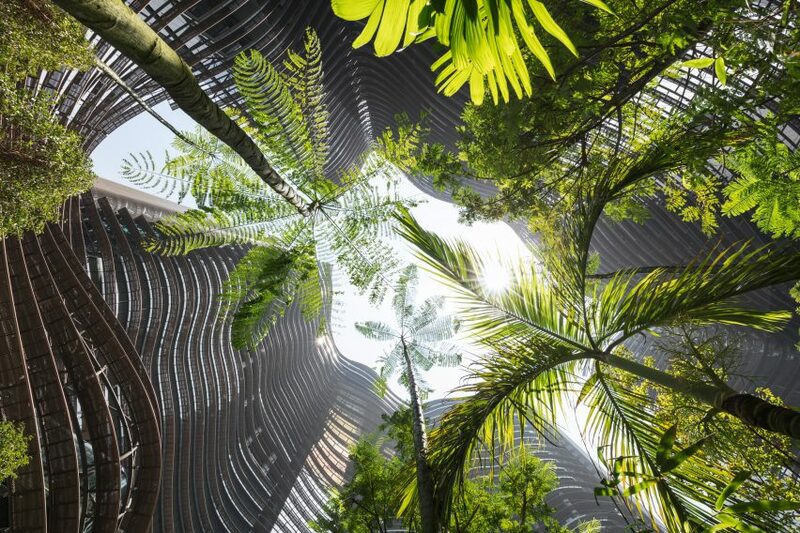 “Inspired by Asian paddy field terraces, the green centre formed by the four towers – with its multi-storey three-dimensional gardens – reflects the diversity of tropical flora and creates a new habitat,” said the architects. 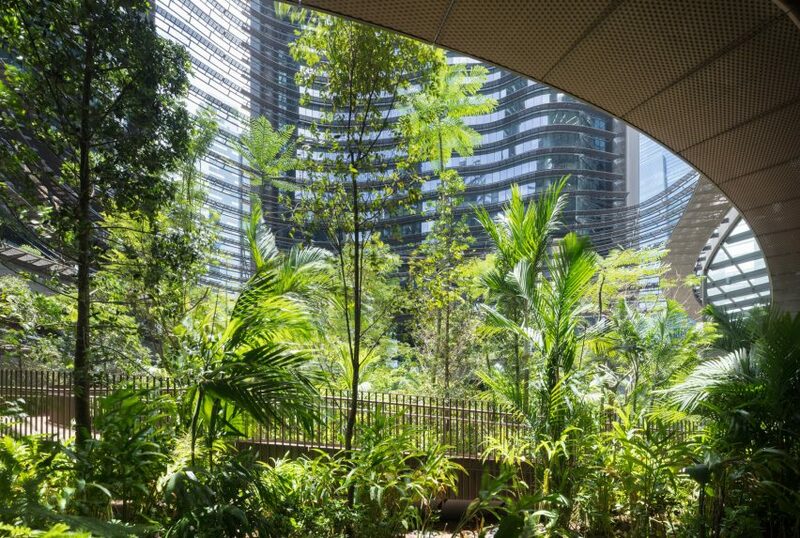 The project team also suggested that the landscape architecture mimics the natural configuration of a rainforest valley, with the changes in climate across different levels reflected in the planting. The verdant space contributes to an improvement in the microclimate at the heart of the complex, while the organic shape of the surrounding walls enhances natural ventilation. The lowest level of the garden features pathways connecting the various towers, as well as a direct route across the centre of the space that traverses a reflecting pond. Residents, office workers and visitors have access to restaurants, cafes, retail areas, a fitness club, pool, supermarket, and food court located on the open terraces around the perimeter of the garden. Wooden walkways, stone paving and bronze tones used for the louvres and interior spaces complement the garden’s natural aesthetic. 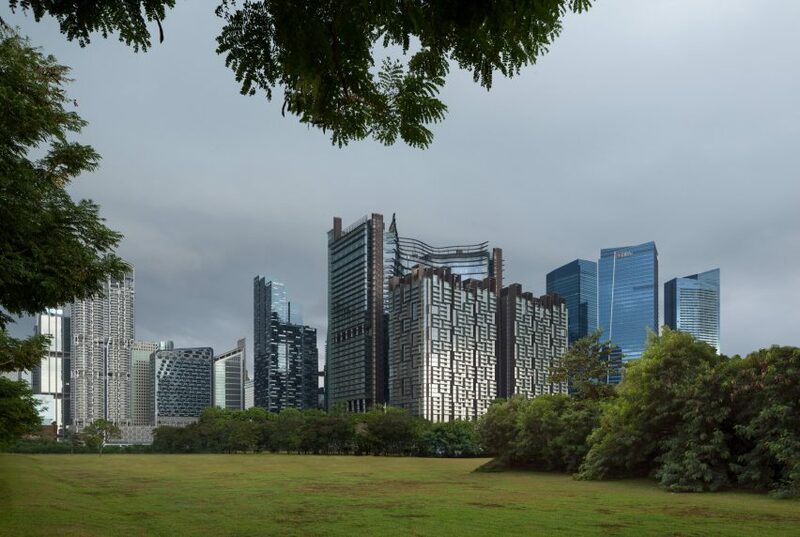 Visualisations of the planned gardens were released in 2015, at which time the project team claimed that the planted space “is designed to create inspiring and multifunctional urban spaces to be enjoyed by all in Singapore”. Photography is by H G Esch.